Which Countries Get the Best Deals Out Of the Trans-Pacific Partnership? Vietnam is a clear winner. The United States? Not so much. This week, the Senate is set to debate a measure that would "fast-track" negotiations on the White House-backed Trans-Pacific Partnership. This proposed partnership has divided Washington in an unusual way. Congressional Republicans and corporate lobbyists have joined the president in supporting the trade agreement, while many Democrats and a wide range of activist groups have come out against. The chart below breaks down just how the proposed partnership would impact the countries involved, based on estimates from the Peterson Institute for International Economics. 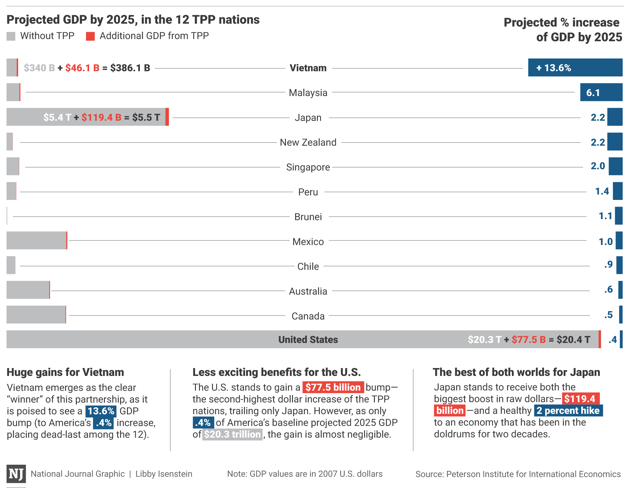 Vietnam is in the best position of the 12 nations, poised to see a $46 billion bump in GDP by 2025, an additional 13.6 percent of the baseline GDP projected for that year without the TPP. This story was updated on May 11, 2015.